Filled with activities and more than 300 stickers, this colourful, fun book for little travellers will keep kids entertained for hours. Perfect for journeys to the seaside at home or abroad!This fabulous activity book is packed with cool games such as Sandcastle maze and Shell-spotting games. Write, draw, play, stick, explore, and lots, lots more. This boredom-buster will get kids using their imagination and looking around them, rather than staring at a screen and it's educational too, with quizzes, top three lists, and seaside stats that kids will love.Inventive and creative, the At the Seaside Activity Book will keep kids occupied, whether in the car, on holiday, or even tucked up in bed at home!Filled with activities and more than 300 stickers, this colourful, fun book for little travellers will keep kids entertained for hours. Perfect for journeys to the seaside at home or abroad!This fabulous activity book is packed with cool games such as Sandcastle maze and Shell-spotting games. Write, draw, play, stick, explore, and lots, lots more. 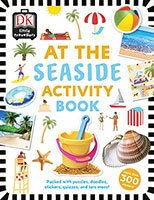 This boredom-buster will get kids using their imagination and looking around them, rather than staring at a screen and it's educational too, with quizzes, top three lists, and seaside stats that kids will love.Inventive and creative, the At the Seaside Activity Book will keep kids occupied, whether in the car, on holiday, or even tucked up in bed at home! Have fun at the seaside with stickers, games, and activities for kids on the move!